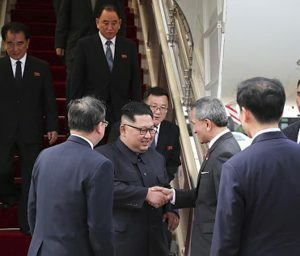 Singapore, June 10 : North Korean leader Kim Jong Un arrived Sunday in Singapore ahead of one of the most unusual and highly anticipated summits in recent world history, a sit-down with President Donald Trump meant to settle a standoff over Pyongyang’s nuclear bomb arsenal. A jet carrying Kim landed Sunday afternoon amid huge security precautions on this city-state island. After shaking hands with the Singapore foreign minister, Kim sped through the city’s streets in a large limousine, two large North Korean flags fluttering on the hood, surrounded by other black vehicles with tinted windows and bound for the luxurious and massively guarded St. Regis Hotel. Trump was scheduled to arrive later Sunday. Part of the interest in Tuesday’s summit is simply a reflection of Kim’s limited appearances on the world stage. He has only publicly left his country three times since taking power after his father’s death in late 2011 — twice traveling to China and once across his shared border with the South to the southern part of the Demilitarized Zone in recent summits with the leaders of China and South Korea respectively. But it is Kim’s pursuit of nuclear weapons that gives his meeting with Trump such high stakes. The meeting was initially meant to rid North Korea of its nuclear weapons, but the talks have been portrayed by Trump in recent days more as a get-to-know-you session. Trump has also raised the possibility of further summits and an agreement ending the Korean War by replacing the armistice signed in 1953 with a peace treaty. China and South Korea would have to sign off on any legal treaty.